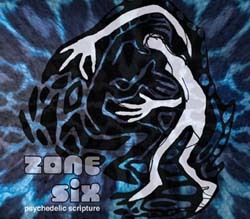 Zone Six - "Psychedelic Scripture"
This is the third release on the new Sunhair label. These Zone Six recordings are taken from some years back (October 2000) but still sound like fresh and exciting psychedelic journeys. The band is a five piece on these recordings with Dave on bass, flute and percussion, Hans-Peter on guitar, Claus on drums, Rusty on keyboards and voice and Martin on synthesizer and bells. The CD features 3 long tracks (2 at 14 and one at 21 minutes). "Extremandura" starts the CD with some strange sounds before the trip to Egypt or somewhere in the past begins. The middle eastern style guitar is very cool and lots of great sounds and effects swirl in and out of the picture as the guitar slowly builds and comes down around 5 minutes into a totally spaced out section that floats on until the end going through various phases getting quite intense at the end. "The Pipe Dream" (21 minutes) starts with spacey synths and a strange drone as the bass line floats (synthesizer based?) in and is quite repetitive a bit like early Tangerine Dream or something….Claus and Dave join after a while and it gets more and more intense (including a cool didgeridoo like sound) but still no obvious guitar by 11 minutes and then finally Hans-Peter kicks in a bit around 15 minutes as the track continues to maintain a high energy level. "The Sacred Toad" closes the CD as we head out into space for a final journey. This track is slow to build up and is full of all sorts of strange things passing in and out of the soundscape before settling into a bit of a drone. Cool stuff and another beautiful digipack release from Sunhair! I hope we hear more from Zone Six! For more information you can visit the Zone Six web site at: http://www.zonesix.de or http://www.psychedelic-network.de.